The DoubleTalk is a full length Zorro II card which implements AppleTalk networking. An A500 version was also available which connects to the side expansion slot. It can be used for Amiga to Amiga networking, or Amiga to Apple Macintosh networking and supports the sharing of files and printers. 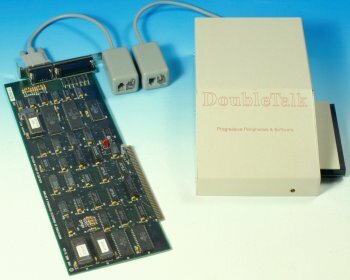 The name DoubleTalk relates to the highspeed mode of the card which can transfer at 460Kpbs, however the highspeed mode is only supported if the network is entirely Amiga based, otherwise the standard speed of 320Kps is used. The network uses standard phone-style cables (probably US style). An extra 25pin serial port is also provided. The supplied software is called Network Manager which is used to configure the network. Files and printers can be shared, and password protected if necessary, or restricted to a user or group. A network mail facility is also supplied, simply called NetMail. DoubleTalk also supports some distributed processing applications such as 3D Professional. Page contributors: Iggy Drougge, RiWa & Friends, Sam Pettus.